The idea of turning 30 was devastating to me a year ago. It was all about being “out” of the twenty-something group, being “old” and entering real adulthood. Little did I know this was going to be the most enlightening age to me yet. 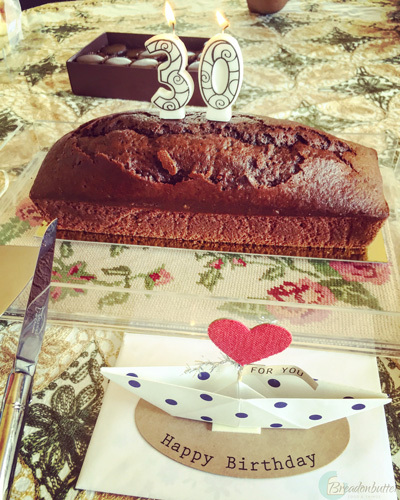 On the 19th of August, a little over two weeks ago, I gracefully turned 30. What I thought was going to be shocking to me was actually smooth and soothing. I was expecting it to hurt but I didn’t feel a thing. It was like my fear of needles. Whenever I have to go through blood tests or donate blood, I become so fragile and needy it’s actually quite pathetic. What I usually do is sit on the chair, extend my hand and turn my head away. It then takes a second and a teeny tiny twinge and it’s done. During my 29th year of life, I had moments of panic. What was I doing with my career? Was I wasting my time in a job I knew I didn’t like? Had I waited too long to have kids? Was I not traveling as much as I wanted? Were we saving enough money for our future? Questions like these often came to mind and moments of crisis filled my year continuously. Then, on the day of my 30th birthday, like magic, it all went away. I woke up calm and serene. All of my fears had suddenly vanished. I had been accumulating advice, anecdotes from wise and experienced people, stories of people in their fifties, wise words from my mom, dad and other people in their fifties and sixties I admire. These all came together on that day. The day I turned 30. Back when I was arduously watching Mad Men, Don said something that stuck with me forever. He said something along the lines of “when you have a problem, think about it, think about it, think about it, and then let it go. That’s how you’ll get your solution.” I guess this is what happened, I just let it go. What I do now is unconsciously turn a blind eye to the questions I previously had. See, the key is to appreciate what is there. I am happily married, excelling at the job I don’t like but also working hard on the side on the stuff I do like, we’re expecting our first child this February, we moved into our own house last November and we’re working towards our goals. This is actually quite amazing! The only thing I’d like to do more of is travel but I’ll never get enough of it anyway so that doesn’t count 🙂 I actually cannot wait to see what this year holds for me and thinking about all the magical possibilities leaves a sparkle of excitement. Mabrouk on the great news! Thrilled for you and Jean!